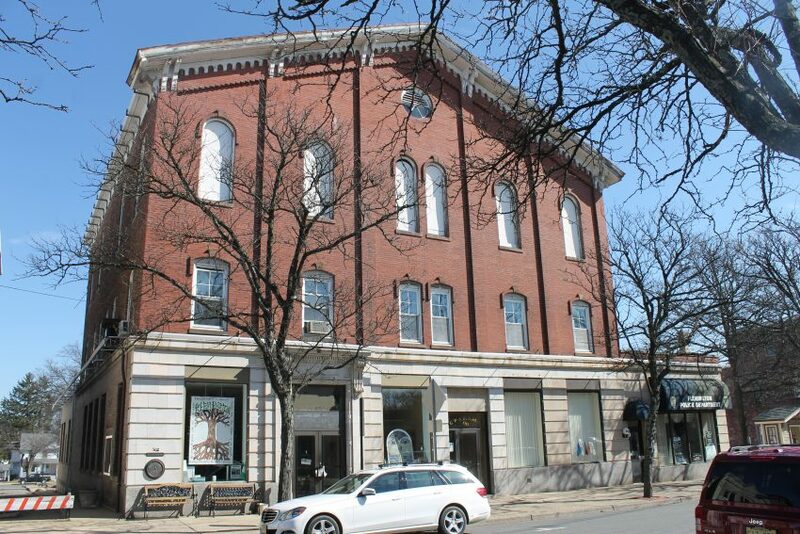 While we do not have a firm date, it seems likely that the Hunterdon County National Bank Building is the earliest of Flemington’s grand Italianate commercial structures. Its bold and simple form and relatively simple detail place it closer to the 1860’s than the 1880’s. 50 Main – the Town Clock Building – dates from 1874; 76 Main – the Union Hotel – was built in 1877 & 1878; and the two story County Hall of Records was built in 1870. The cornerstone on the Deats Building reads 1881; and 56 Main – the Flemington National Bank Building – was built much later, in 1897. Tradition says that 90 Main Street was modeled on Ford’s Theater in Washington D.C.; that building gained national infamy when President Lincoln was assassinated inside shortly after it opened in 1865. The similarity between the two buildings lies in their unusual rooflines; normally late nineteenth century Italiante buildings did not emphasize the slope of the roof, rather they were designed with bold horizontal cornices and relatively low sloped hipped roofs which cannot be seen clearly from below. Instead, this design features a boldly projecting and dramatically sloping cornice, which dominates the street below. The other similarity lies in the rhythm of the projecting brick pilasters across the front, which rise up to pairs of large scrolled brackets. Between the pilasters are segmental arched windows on the second floor, and taller semicircular arched windows on the third floor. The windows paired in the center bay, and slightly wider single windows in the two bays to each side. The arches have simple single brick hoods, with uncarved sandstone keystones. The tops of the pilasters are joined by a sawtoothed brick projection which follows the slope of the cornice. Above that, there is a wood dentil detail between the pairs of brackets. In the center, above the pair for windows, there is a large circular window into the attic. The original bulls-eye window had a lovely pattern of eight petals. The third floor windows on Main Street had a pattern of two semicircular arches below a central full circle, several of these still remain in place behind the plywood. The first floor was originally build of brick, with a series of large semicircular arched openings unrelated to the rhythm of the pilasters above. The whole first floor was rebuilt by the Bank sometime in the 1920’s; the wood structure of the floor itself was replaced with a concrete floor, and the whole front facade was replaced with the current rectangular window openings, set into terracotta walls on a granite base. Inside, the first floor has been extensively altered, the bank on the north side has a large safety deposit vault with an elaborate stainless steel circular door. Some of the original tin ceilings remain, at 13 feet above the floor, they are concealed high above lower, modern ceilings. The basement level has three more vaults, with functional but still handsome steel doors. A wide stair from the sidewalk now leads up to the second floor, which has a series of offices with wood floors and 10 foot high plaster ceilings. From there, a narrow stair runs up to the third floor, now an abandoned set of large offices. When first built however, the third floor was apparently one huge room, 60 feet by 60 feet by 15 feet high, lit by tall windows on all four sides. Like similar rooms on the third floors of the Deats Building, or of 123 Main Street, this room must have been a social hall, a banquet hall or a meeting place of a fraternal order. The three foot tall plaster cove which distinguished this room still wraps around all four exterior walls, its upper and lower edges are marked by cast plaster decorative bands. On the Main Street side, there is a narrow wooden mezzanine, with a decorative wavy wood railing. To create the wide open space of the hall, the attic was framed with three great timber trusses. The lower chords of these triangular trusses support the flat ceiling of the great hall; these chords are single hewn timbers, each over 60 feet long. The first floor has been added onto; the extension to the south along Main Street occurred when the façade was remodeled; while the extension to the rear dates from the 1950’s, when the banking hall was also rebuilt and the vault installed. Please take action today by signing the petition to save the four historical buildings in Flemington that face the danger of demolition!